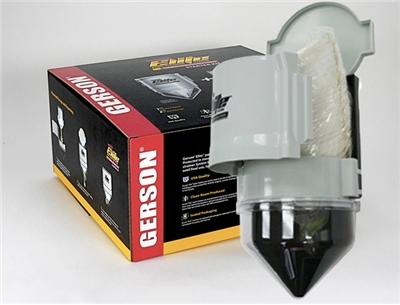 Gerson has introduced their new contamination free strainer dispenser system. Designed for truly convenient management of strainers ensuring they are clean and dust free prior to use. The Starter Kit contains a high quality, patent pending wall mount dispenser along with 2 "Pods" of strainers. Each sealed Pod contains 125 strainers. Refill Pods are available individually or in cases of 4 Pods (500 strainers). Choose from 260 micron (Medium - Color Code Orange) or 190 micron (Fine - Color Code Yellow) or 125 micron (Very Fine - Color Code Blue). This new system is an Excellent Value for any shop! 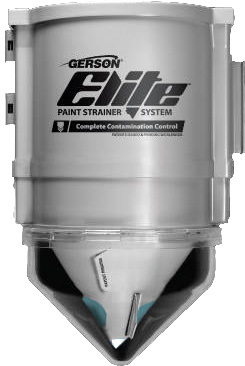 "Failing to filter finishes immediately prior to loading into your spray system is one of the leading causes of contaminated and less than perfect spray finish results." 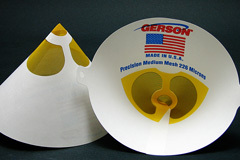 Gerson synthetic mesh strainers are USA made to the highest quality standards for the most stringent industrial and automotive finishing requirements. They are the finest available for wood finishing applications. Custom-woven with exclusive filter media for guaranteed accurate micron size. Spectographic lot tested: guaranteed free of chemical and particulate contamination sealed in plastic film pack. Patented & Color-Coded filter tip for quicker, more complete filtering. Dense paperboard cone reduces bleed-through. 260 micron (Medium Mesh) is sufficient filtering for most waterbased products. This is the most popular choice. 190 micron (Fine Mesh) is suited for filtering lower viscosity products such as stains, shellac and dye solutions. 125 micron (Very Fine Mesh) is commonly used for dye stains or low viscosity solvent finishes. Most waterbased finishes will also filter through 190 micron (Fine Mesh) but will take a bit longer. It is a good idea for projects being finished in "Gloss" or "Semi-Gloss" as imperfections become more apparent with these higher sheens. Refill Pods of 125 strainers each are available individually or in a case of 4 pods (500 Strainers). High Quality wall mount dispenser for clean storage and easy access to strainers!